In 2004, the first multi-sited clinical trials were conducted to determine if an anti-retroviral drug, Tenofovir, could be taken to prevent HIV transmission – a biomedical technology known as pre-exposure prophylaxis (PrEP). Before these trials began, AIDS researchers characterized PrEP as a breakthrough technology that needed to be urgently delivered to the world’s most vulnerable. But at trial onset, controversies over the protocol erupted. These disputes, led by African scientists and global AIDS activists, were not recognized as actual ethics claims. Rather trial sponsors declared that those who ‘disrupted’ the trials did not understand clinical science. Actors at the host sites in Cambodia, Cameroon, Nigeria, and Thailand attempted to negotiate a modified trial design. When that failed to happen, three sites shut down (and one site refused IRB approval) leading to one of the biggest controversies that the world of AIDS research and activism experienced. Drawing on the disputes in Nigeria, this talk poses two questions: why is there no ethical crisis when recognition of ethical claims fails to happen? And after years of HIV ethics disputes throughout Africa, why do claims of ethics violations persist? 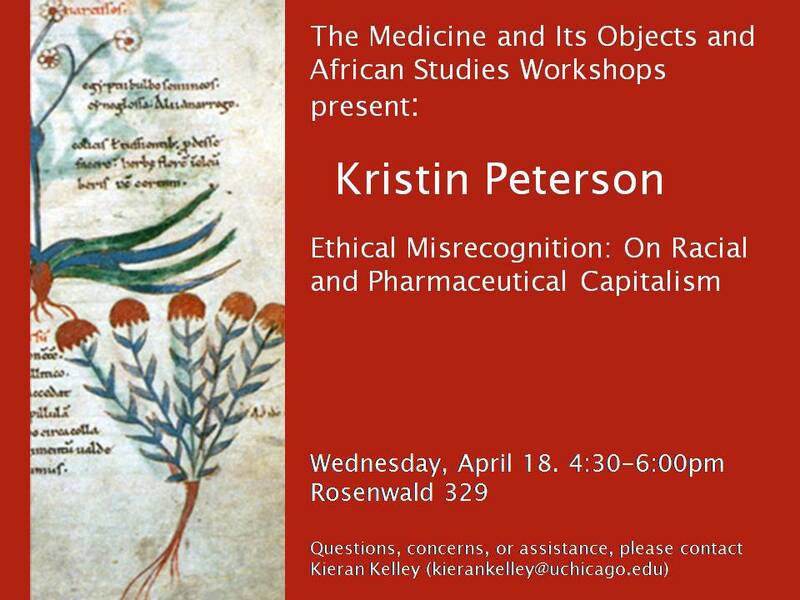 The talk analyzes how two forms of capitalism – pharmaceutical and racial – configure the ethical as a particular logic in offshored research: as pervasive crisis and pervasive invisibility. Within this framework, the term, ethical misrecognition, is a construct of modern knowledge that elaborates on how African ethics claims are racially configured as unthinkable, and therefore made to look like they never happened. Kristin Peterson is Associate Professor of Anthropology at University of California Irvine. Her research and writing are concerned with theories of capital and property; “popular” economies, trade, and markets; health, science, and medicine studies; and postcolonial theory. She is especially interested in bringing medical anthropology and science and technology studies in conversation with African Studies and postcolonial iterations of political economy. Refreshments will be served. To receive the paper, or if you have any questions or require assistance to attend, email the workshop coordinator: Kieran Kelley (kierankelley@uchicago.edu).